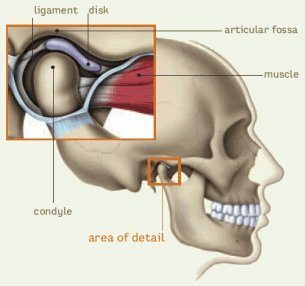 Noise inside your jaw joints [Temporal Mandibular Joints–or T.M.J.] may be a sign of Temporal Mandibular Disorder [or T.M.D.]. TMD is the group of disorders and symptoms of the TMJ joints that describing the noise, pain and dysfunction of the jaw joints. If your jaws joints pop, hurt or “lock up”, this is not normal, and needs to be treated. If left untreated, TMD will almost always get worse. TMD is treated with drugs [Botox and NSAIDS like ibuprophen], splints, behavioral modification [I.e. changing damaging habits like chewing ice or gum] and patience.